Thank you for visiting my site. Whether you are an advanced artist, beginner or a collector of fine art, I hope your visit to my site will be an enjoyable one. I am a multi-media artist specializing in Acrylics, Oils, Pencil, Watercolors, Enamels and Airbrush. I live in Belleview, Florida which is located next to Ocala in Marion County. I have been painting and drawing for over 25 years. I am a graphic artist and a fine artist. I paint on various types of surfaces; from small canvas pantings to large wall murals. If I am not painting in my studio, more than likely i am painting outdoors where I paint from life, "En Plein Air" (French for "open air"). Click here to see the press release articles covering my art career throughout the years. 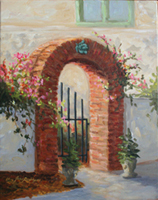 En Plein Air Painting "Arbor Dreams"
Click here to go to my photography site.